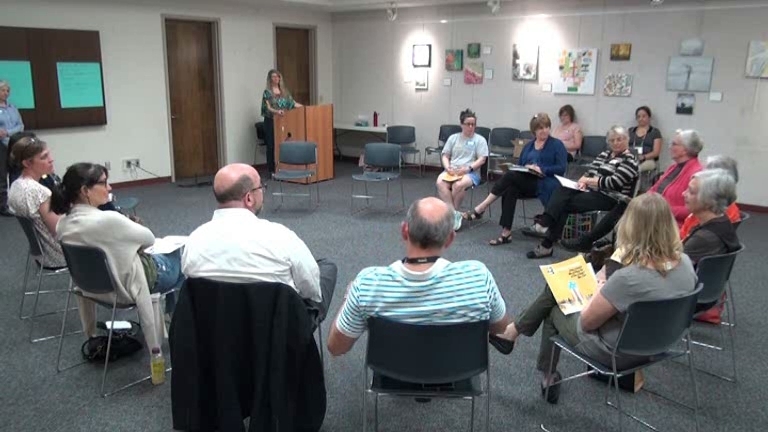 The small group assembled at the Oconee County Library to discuss immigration expressed one significant disappointment at the end of its two-hour long deliberation. There was much more agreement among the participants than disagreement, those engaged in the conversation said, and the discussion was limited because of it. In general, the individuals were welcoming of immigrants, agreeing that they have helped make the country what it is today. They were skeptical of the argument that current levels of immigration are too high and of proposals to cut back on the number of immigrants entering the country. The event was organized by the Oconee Progressives and was designed as part of the National Issues Forums of the Kettering Foundation, a nonprofit operating foundation, based in Dayton, Ohio, that focuses on deliberation in service of democracy. Margaret Holt, a retired University of Georgia Adult Education professor who has worked extensively with the Kettering Foundation and is active with Oconee Progressives, said a lack of diversity of opinion in National Issues Forums is a common problem. “I’ve been doing forums since 1981,” she said. “Unfortunately, at every forum I’ve been to, there has been regret expressed that other voices weren’t there. “But we are going to keep trying,” she added. Invitations to participate in the Forum said it was open to the public and did not state a position on immigration. A summary of the local discussions will be sent to Kettering and then be presented at a press conference in Washington, according to Holt. “I really wanted Oconee County to weigh in on this,” she said. The National Issues Forums is a network of organizations associated with the Kettering Foundation that brings together citizens to talk about pressing social and political issues of the day. As the Forum started at 3 p.m. on March 18 at the Oconee County Library in Watkinsville, 11 people were seated in a circle, with Tracey Wyatt at the podium at the front of the Room. Five individuals were seated outside the circle, including me, and others joined the group as the discussion progressed. Wyatt is one of the organizers of Oconee Progressives, an informal local group that has sponsored programs on a number of issues, including on bullying in schools and on building common understanding across partisan divides. Confirmation of the shared perspectives of those in the circle came about half way through the discussion when one of those in the circle asked how many people in the room had traveled outside the U.S.
All those in the circle raised a hand. “Maybe we should have broadened our invite,” one of those in the group said. The participants were given a booklet at the start of the program called Coming To America: Who Should We Welcome, What Should We Do? The booklet spelled out three options, which the Oconee County participants discussed in order. The first option was labeled: Welcome Immigrants, Be A Beacon Of Freedom. The Oconee County participants stated opposition to making English the official language of the country and in favor of open borders. The also were in favor of immigration policy favoring family unification. “All of the economic growth has to come from immigration,” she added. The second option in the booklet was called: Enforce The Law, Be Fair to Those Who Follow The Rules. If a person has committed a crime, that is a different matter, she added. The group was particularly concerned about deporting children brought to the country illegally by their parents. The third option given the group was called: Slow Down And Rebuild Our Common Bonds. One of the participants blamed the federal government and the media for a deterioration of the a sense of national identity, not the immigrants. “I don’t think immigration is to be blamed at all,” he said. The video below is of he entire session, which begins with an introduction of the topic and a short video clip. Discussion of Option 1 begins at 32:52 in the video. Discussion of Option 2 begins at 1:00 in the video. Discussion of Option 3 is at 1:30 in the video. OCO: Oconee Progressives Immigration Forum from Lee Becker on Vimeo. Lee, Thank you so much for all your articles over the years. You make us think and consider many issues that are imporstant to our community. We are not always in complete agreement of the solution but do agree to make Oconee better. Oconee would not be such a wonderful place if it were not for you and your voice of reason through excellence in journalism. Bless you, my good man. "Deportation is an insult" but then it is a different matter if a person has committed a crime. Hence the current confusing rhetoric by the left in America. When they constantly conflate "immigration" with "deportation" or "fear," glaringly missing are the words "criminal" and "illegal." Laying aside the crime of entering the country illegally, the resistance seems to only decry the deportation of criminals. How many times do we have to say it? Conservatives are NOT against legal immigration. That this circle of "progressives" (leftists) claims to be speaking for Oconee County is downright ludicrous. When they become honest enough to stop mixing "illegal" and "criminal" in with "immigration," we can have a real discussion. You can put in your zip code to identify yourself as from the area where the local forum was held. What is legal about undocumented?